Let me ask you a question, are you tired of saying you want to feel better - mind and body - and then doing nothing about it? How about starting a new healthy habit only to give up after a few days? I will be vulnerable, I have BEEN there. Many many many (x 10) times. 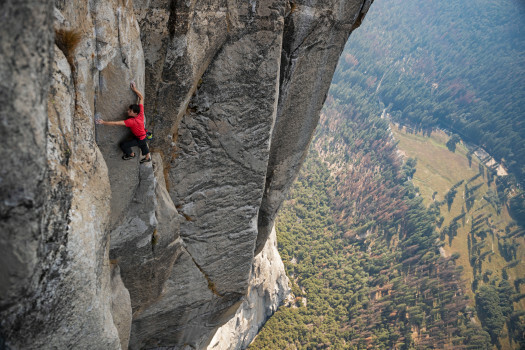 Alex Honnold Free Soloing El Capitan in Yellowstone National Park. The biggest reason most of us give up on building a new habit is because in the initial motivation high, we make a ton of changes all at once. We see the mountain and start trying to “Alex Honnold Free Solo it” up, without ever learning how to climb. This is the same for building a movement practice. Add on the challenge of daily depression and anxiety, and our mood inconsistencies have us making a breaking promises and plans all day long, which leaves us feeling more negative about ourselves and hopeless in our efforts. Exercise, as it’s been scientifically proven many times, can prevent, decrease, and reduce relapse of depression and anxiety. I personally know the effects of Major Depression and Anxiety having struggled with both in my early 20’s, and even today, when short term symptoms pop up from time to time. Exercise - moving my body in some form daily - was what helped me build healthier mental and physical habits to give me the confidence to climb out of my metaphoric deep dark hole into the light. At the time it felt like a hole, I didn’t feel like I was free soloing a mountain. In hindsight, looking back towards where I came, that’s exactly what I did. with the intention of proving to myself that I could strengthen my mindset to pull myself up out of the dark a little more every day. I felt myself become mentally stronger. Now I want to share this idea with you. If you want to build better habits, sign up for this 30 Days of Movement Program - it is completely free to do. What are you waiting for? What do you have to lose? Build the habit of moving your body every day. Move with me for 30 Days. Older PostWhy I Can't Do It.